Vintage Lucy's accepts all major credit cards, e-check or existing funds payment through Paypal. Paypal is a safe, secure way to pay, and a Paypal account is not required. During checkout, select Paypal as your payment method. You will then be redirected to Paypal's site where you may choose to proceed with payment without creating a Paypal account. 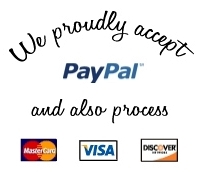 We also process visa, mastercard and discover for those of you who do not wish to use paypal. Vintage Lucy's currently ships all USA USPS and worldwide. Customers receive a tracking number via email please be on top of tracking, we are not responsible for packages taken out of your mailbox or doorstep. We are NOT liable for lost or damaged items going out of the United States so please be aware of this at time of purchase. shipping is based on amount you order. Vintage Lucy's accepts exchanges for products that have not been washed, worn or damaged and the tags must be attached to the garment. You can exchange your product for a full store credit 5 days after recieving the item as NO REFUNDS will be given at anytime. Vintage Lucy's will not pay for the return cost of shipping but will pay for the shipping back to your original shipping address for exchanges. Please send your returns or exchanges with Product, Original Packaging, Invoice, and a note stating if you would like to exchange and for what items or a store credit, Customer must track package! Due to the nature of our handmade items at times we may run out of the exact trim or fabric but we try our best to find an almost identical or better replacement for that item. Thank you for trusting our Vintage Lucy's team! Your privacy is very important to Vintage lucys! We will only use the information that we collect about you lawfully. We will not disclose your information to a third party at any time. We collect information that you supply to us when you make an enquiry, join our mailing list or place an order. We keep this information about you to process your order and to provide you with the best possible service. Our Handmade COTTON items are NOT PRE WASHED. Please allow for small shrinkage about 1 inch max. Please wash items in cold water and hang dry if possible or tumble on low. These instructions are also on hanging tag. For our red raglan sleeve we have gotten a few(one) t-shirts that bleed a little red on the first wash causing discoloration of a pinkish around neck area or armpit area. This is common on ALL raglans with different businesse. To prep your raglan for its FIRST wash, mix vinegar and epsom salt together in cool water. Then soak the red sleeves and dab some around neck area as well for about 15-25 minutes. You will see the vinegar solution pinkish red, that is the excess dye from the manufacture. You only need to do this once. I personally wash my Vintage Tees with my colored clothes in cold water, and they last for years!